Dim sum restaurants in LA come and go all the time. What was once a hot spot for great food could become a sushi restaurant or in most cases another dim sum restaurant but with a different name. They always brag about spending loads of money to hire the best chefs in Hong Kong to make a great dim sum. Eventually, the chef moves on, quite possibly to another restaurant that offered him more money, and the cycle continues. I’m not sure how old or new Lunasia is. I found this place out while ready Eating LA, hmm foie gras dumplings eh? Everytime I come home I have to have some dim sum. So I dragged my family out to see what Lunasia was all about. The first thing about dim sum is that either you get there super early or prepare to wait for hours. Dim sum is not fast food. People tend to linger at their table drinking tea. We made the mistake of getting there close to noon and we waited for an hour to squeeze into a table for 4 with the 5 of us. There are 2 types of dim sum restaurants. There are the old school style with carts being pushed by old lady and the new kind with the pencil and paper where you mark down what dishes you want. Lunasia was the latter. With the 5 of us we got about 10 dishes. By the 7th dish I realized we got a bit too much food. We obviously ordered few of the classics. Ha gow, siu mai, chicken feet, beef tripe, ja leung, roast pork cheung fun, steamed and baked roast pork buns, gum sa bao (gum is gold and sa is sand) and turnip cakes. The turnip cakes were excellent, the soy sauced was too salty for the ja leung, beef tripe was super spicy, the chicken feet were a bit bland, the cheung fun and pork buns were pretty standard and the ha gows were gigantic with 4 shrimps stuffed into it thats crazy! Not sure what’s the English name for gum sa bao is. They’re buns filled with HOT (sometimes if you’re lucky to get the fresh ones) yellowy custard like liquid. Like the juicy buns, be careful when you bite into one. When the custard flows out of the bun it looks like gold sand flowing out. The ones we had at Lunasia was quite awesome. We also ordered some nontraditional dim sum dishes. Salt and pepper squid, duck pie, Macau pork belly and peanut with sugar pancakes. The squid was perfectly fried and was probably the best dish that day, the diced duck meat stuffed in a puffed pastry was pretty good, not sure what made the pork belly Macau style but it tasted like any roasted pork and the peanut pancake was surprisingly good, while it was still warm. 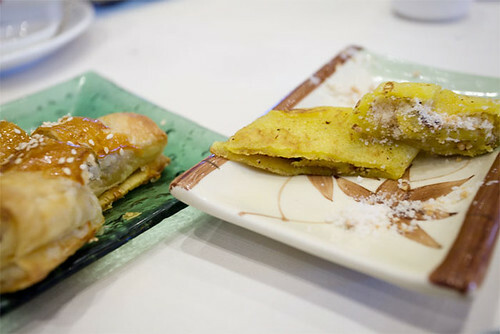 As like many of the dim sum places, Lunasia is no different. 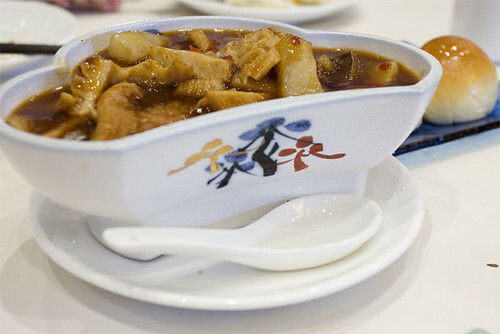 It had some great dishes but also some meh dishes. 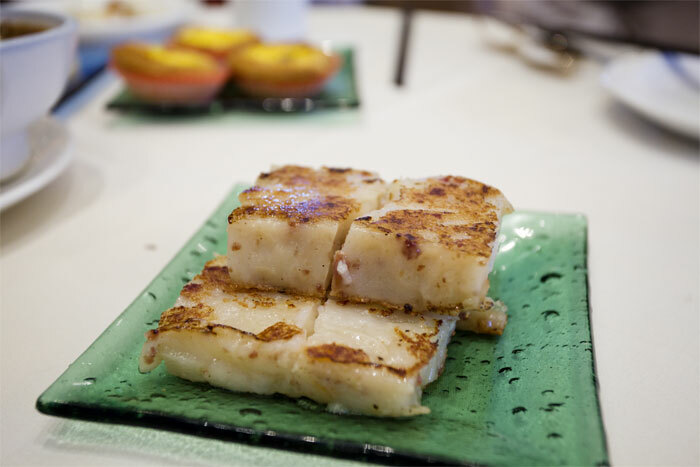 The turnip cakes and the squid were the 2 best dishes out of the 10 that we ordered. If the lady didn’t douse the ja leung with super salty soy sauce it would’ve been great. The ha gow and siu mai were just too over stuffed with filling. It’s really tough to find the perfect dim sum place.